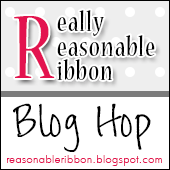 Welcome to the Really Reasonable Ribbon December Blog Hop. 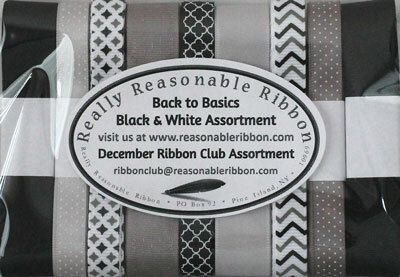 This month the Really Reasonable Ribbon Monthly Ribbon Club Assortment is a classic white/gray/black color combo. Perfect together and also great to mix with leftover ribbons from previous assortments. The December Assortment contains 9 styles and a total of 18 yards of ribbon. Each monthly assortment is a color or holiday themed ribbon collection. What a fun way to build your ribbon stash and try new ribbon styles. I love the classic white/black color combination and by adding one bright color you can really make it pop. I used some gorgeous dies from Cheery Lynn Designs to create my card along with the gorgeous ribbons from the December Ribbon Club Assortment. My beautiful bow was created on my Zutter Bo w it All V3.0 Tool using two 5/8″ ribbon styles from the December Ribbon Club Assortment. The center of the bow was finished off with a pretty Star Shape Pearl Embellishment. For a video tutorial on how I created with pretty bi-color bow, please click HERE. 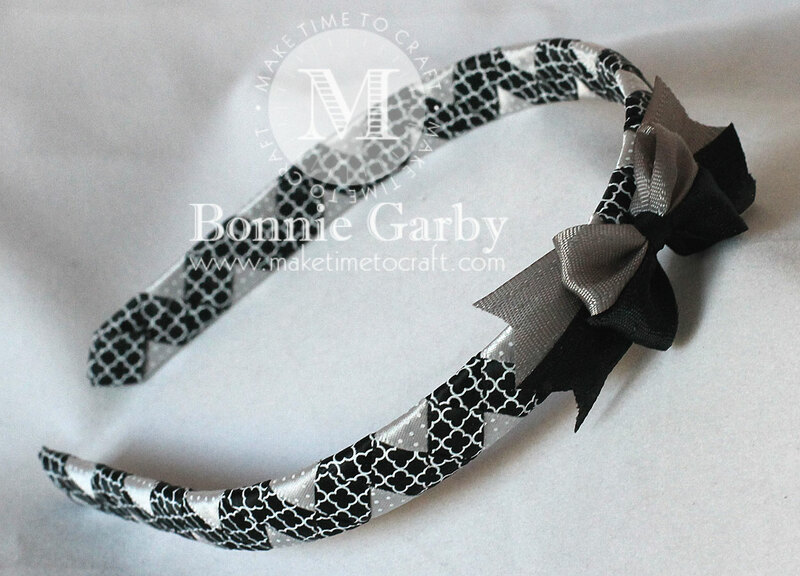 This headband was created on a 1/2″ White Plastic Headband using the two of the 3/8″ printed satin ribbons from the December Ribbon Club Assortment. Terrific card with that pop of yellow. 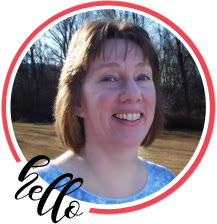 Saw your card at 613 Ave C – thank you for sharing it with us Bonnie! 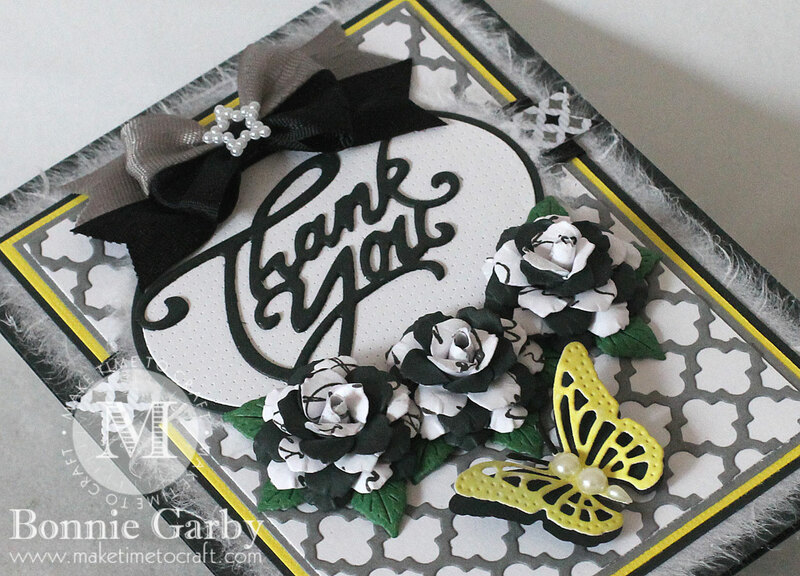 What a lush & beautiful thank you card – I love the black, grey and yellow palette. A gorgeous card and another amazing headband. SO pretty, as always! Thanks so much for sharing your sweet projects with us at Word Art Wednesday, and thank you so much for your generous support of our challenges this year. I hope you have a wonderful Christmas, and that 2018 brings record sales and success for RRR. Pretty projects. I like the touch of yellow on the card. What a beautiful card….I love how the yellow pops with the black, white and gray! Great use of die cuts and beautiful embellishments with the ribbon. Thanks so much for joining our Anything Goes challenge at Tuesday Throwdown! What a gorgeous card! love the colors!! Love the pop of Dr against the monochromatic colors and that now is luscious. Great seeing you join in at the Tuesday Throwdown challenge this week.